There is a business idea called, among other names, the project management triangle. 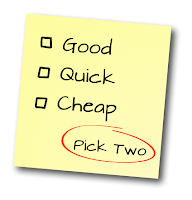 Basically, any project has three priorities – speed, quality and cost – and these are the points on the triangle. 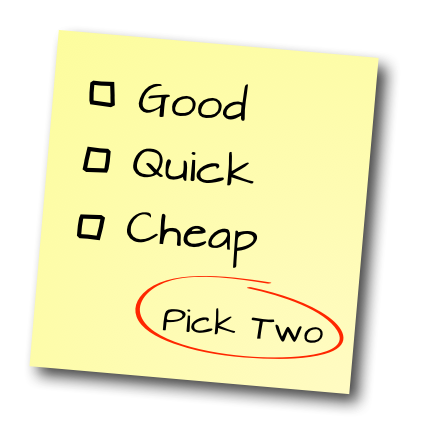 Ideally you want to quickly deploy high quality products at minimal cost, but in reality, there are usually tradeoffs. If you want more of one, you usually have to sacrifice one of the others (and sometimes both). Most anyone in business had encountered some form of this idea. For me, it was most succinctly summed up by David Gerrold in one of his Solomon Short quotes: Good, quick, cheap. Pick two. A similar triangle presents itself when it comes time to present players with a choice. There is a great fondness in game design these days for “hard choices”. This is one of those ideas that people instinctively understand, to a point. The problem is that a lot of things can make a choice hard, but hitting any one of them too hard produces something that’s out of skew. The three points on our choice triangle are meaning, clarity and urgency. As with the project management triangle, we are usually forced by necessity to only hit two of these points, but by understanding these tradeoffs, we can avoid hitting only one of them to our own detriment. Sidebar: Player Vs Character – One important thing about these three points is that they matter both in and out of fiction, though sometimes in slightly different ways. Thus, when I speak about the player and the character, I’m not using them interchangeably here. Meaning is the first thing that people think about when they consider hard choices, as it is both obvious and ephemeral. That is, the idea that a choice carries a lot of weight is one we gravitate to, but it can take many many forms. The weight may be emotional or practical, and it most often demands an apples vs oranges kind of comparison. There’s a purity to Sophie’s choice (You must sacrifice one child, which will it be?) that we dig, but more often these choices are between two different values. “What would you do for a million dollars?” is a choice between values and need. “Do you save the king or your lover?” is a choice between love and duty. Examples abound. The main downside with meaning is that it’s rich fare – it is easy to become overwhelmed or desensitized to it when it comes up too often. A game where every choice is meaningful is going to get melodramatic very quickly. Of course, if you remove meaning entirely, then choices get hollow. Ideally, meaning applies equally well to the players as to the character, but that’s not always guaranteed. If a choice is meaningful to the player but not the character then you’re probably fine, but if it’s meaningful to the character but not the player then the disconnect can be rough. At best, the player goes along with it, using sympathy or habit to substitute for genuine investment. At worse, it feels like a hollow exercise. Clarity means having an understanding and the consequences and outcomes of each possible choice. It can come from knowledge of setting and fiction, but it will often come from mechanics, which give clarity to potentially muddy situations. Clarity is especially important in tactical situations, so much so that it’s absence has its own terminology (the “fog of war”) but that doesn’t mean it’s not important elsewhere. While clarity is important to the specific choice, it’s also important to a player’s perspective on the choice – clarity grants confidence. All the strengths of clarity can become weaknesses with excess, reducing choices to mechanical exercises. If you’ve ever read a choose your own adventure with your thumb saving the tough choices, then you’ll understand this – you have sacrificed other elements of the choice (excitement, fear and risk – the angels of uncertainty) in favor of a certain understanding. Implicit in this is one of the real tricks of clarity – there is an idea that if you grasp all the variables, then the best choice will make itself clear. And if that’s true, then choice becomes an exercise in research, which is great in some situations, but not so much for play. But without clarity, choices become muddled, players grow suspicious and play grinds. Clarity is most important to the player – it’s not really possible for something to be clear to a player and not to a character, unless the GM has failed in her duties to communicate. If something is clear to the player but not the character, this may create some friction, but it’s largely a roleplaying opportunity, as it’s up to the player to choose how strongly to engage this division. Urgency depends upon the immediacy of the situation, but can also speak to the immediacy of consequences. That is, the urgency of a ticking time bomb may be obvious, but if forced to choose between trouble now or trouble later, that is also a matter of urgency. Urgency is the most dependent upon player engagement. One strength and weakness of RPGs is that they offer few tools to guarantee pacing – there may be only 3 seconds left on the timer for that bomb, but those three seconds may take an hour to pass, especially if someone is hungry or needs to go to the bathroom. As such, it’s hard to create urgency from scratch. However, urgency builds on itself, and once you get it started it can be a lot easier to maintain – this is at the heart of most good fight scenes. Juggling this is a table skill plain and simple, and that makes it very hard to plan for. Still, without urgency, every choice can become a debate, which is not a prospect I look forward to. Sidebar: The Right Choice – Implicit in all of this is the idea that whatever choice the players are being presented with is genuinely open ended. This is not always the case – there are times when there is (at least according to the GM) a right and wrong choice. This is not automatically bad, but it does mean that you as the GM need to take some extra steps to make sure you’re not being a jerk. It is very easy fro your idea of the right or obvious choice to differ greatly from player experience, and when you punish players for that disconnect, you’re killing everyone’s fun on principle. Consider that each point on this triangle also reveals a reason why someone might make a “wrong” choice. Their values might demand that they make a sub-optimal meaningful choice. A lack of clarity may result in a mistake. Urgency may keep someone from making the choice they would if they had time to think about it. These are great things – they make these fictional choices feel human to us, because they’re the same reasons we make bad choices in real life. This is not to say the choices should not have consequences. But there should not be punishments for a choice being wrong. Wrong decisions are the fuel of play. Treasure them. Obviously the best solution is to get all three of these together, but that’s not always possible (or even desirable), but you can get a lot of juice with simple pairings. Meaning + Clarity – A choice that is clear and meaningful tends to be one of those big, emotional choices that characters chew on and stress about in fiction. Because it lacks urgency, it can just hang over a situation, coloring things and providing a powerful backdrop. 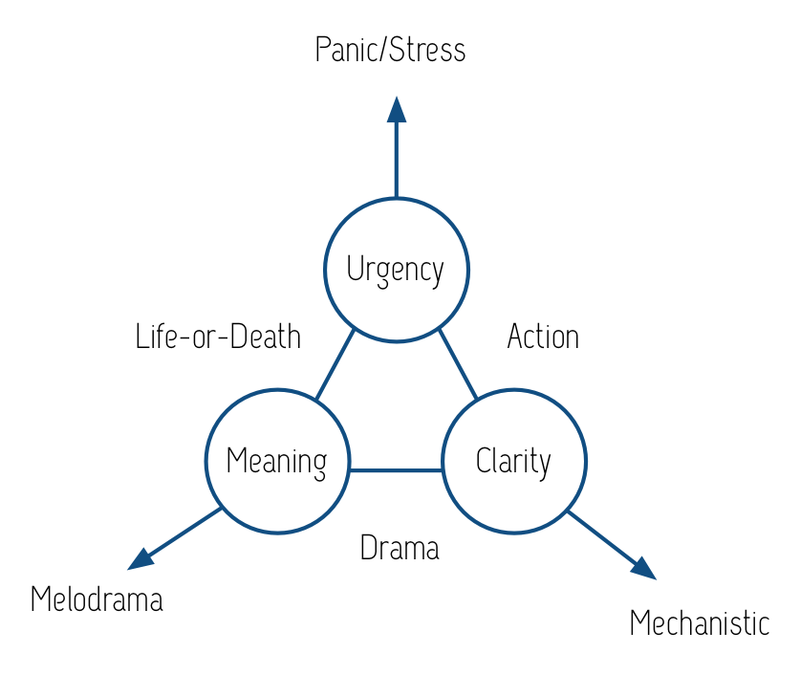 Meaning + Urgency – On the other hand, a choice that is urgent and meaningful tends to be very life or death. Urgency underscores the lack of a clean conversion rate between values, and also prevents compromise, making sure the choice has teeth. Clarity + Urgency – Many tactical choices are clear and urgent, since you need to do something to keep that guy from bashing in your face. Despite the lack of meaning, there are usually consequences to these sort of choices, but they’re usually abstract or resource based. Needing to take action because someone is going to cut your throat is urgent and meaningful, needing to take action because a dagger is about to do 1d4 damage to you is urgent and clear. Anyway, there’s a whole art to offering good, hard choices without being a tool, but hopefully this helps a little. 1 – There are games that depend on this, at least for short term play, and for players who can generate that sympathetic buy in, they can be very satisfying, but that’s not a universal state. 2 – Though you need to be wary of that in Gygaxian play – plenty of adventures will kill you with things that would be obvious to your character but which you overlooked as a player. This entry was posted in Uncategorized on March 16, 2013 by Rob Donoghue. 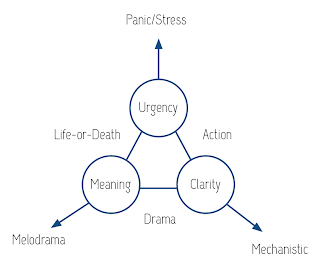 Seems to me that D&D really focuses on the Urgent + Clarity apex, but FATE really does well with the Meaning + Clarity apex, especially as far as Consequences go. Is it possible that OSR-style (old-school) D&D often tends towards Meaning + Urgency dilemmas? (I’m thinking of all those “death DM” stories where people are shouting and if you don’t announce your action right now you’ll get cut in half by the cleaver coming down from the ceiling. BTW what do you mean by “Gygaxian Play”? That phrase may mean different things to different people. Ok it’s been 30 years since I ran that module. Are you talking about adversarial GMing (ie Player vs GM) or the Wargaming style of RPGing where tactical clearing of the dungeons and it’s traps trump character development and character non combat interaction. Pretty much the combination of the two, though adversarial play is probably primary in this particular context, with an emphasis on traps and puzzles which are weighted towards the punishing rather than challenging. Two, why can’t we easily have all three? You tell us we can’t but don’t explain why. From where I sit, your “someone is about to slit your throat” example is meaningful, urgent, _and_ clear. As to getting all three, it’s totally doable, and if you can *always* do it, then your only real danger is too much awesome, but real world complications often spring up to force you to make do with less.